These are an easy, handheld snack that my kids love. And the best part is that they are so nutritious. 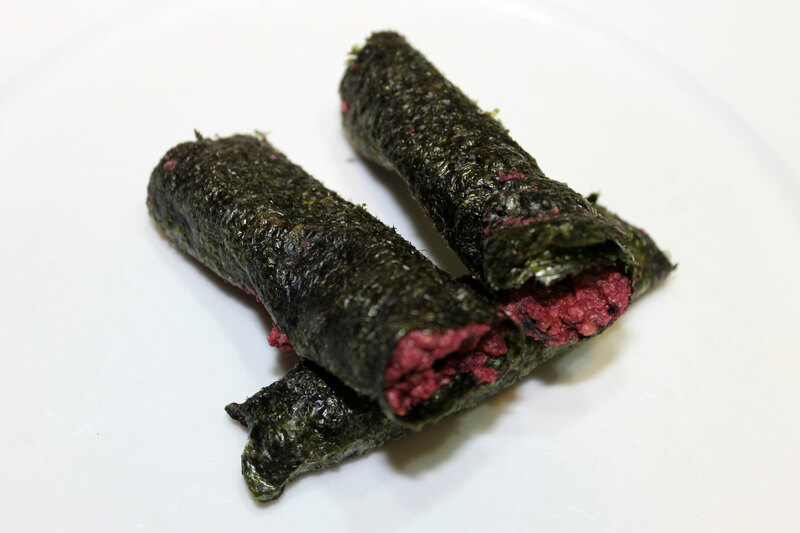 The nori provides some iodine, the veggies provide a ton of antioxidants, vitamins and other minerals. They are a little fiddly and messy to make, but the results are SO worth it! These make a great lunch box filler, or a hand-held snack at any time. You do need a dehydrator to make these. Because these contain bell peppers and sundried tomatoes, they are an AIP stage 4 reintroduction. Place the sunflower seeds, pumpkin seeds, sundried tomatoes, pepper, beet, garlic and cayenne in a food processor. Blend while gradually adding the water until it forms a smooth paste. You may need more or less water depending on how juicy your veggies are. Taste and season with salt and pepper. Avoid using too much salt as it will become more concentrated when dehydrated, and you do not want it to be too salty. Transfer the paste to a small ziplock bag. Press out as much air as possible and seal. Now snip off one corner to turn it into a piping bag. You want to be able to pipe out lines of the paste that are about ¼-½ inch thick. Lay a strip of nori on the counter, shiny side down. Spritz it with a little water using a spray bottle. Pipe a line of the veggie paste down the center of the nori. 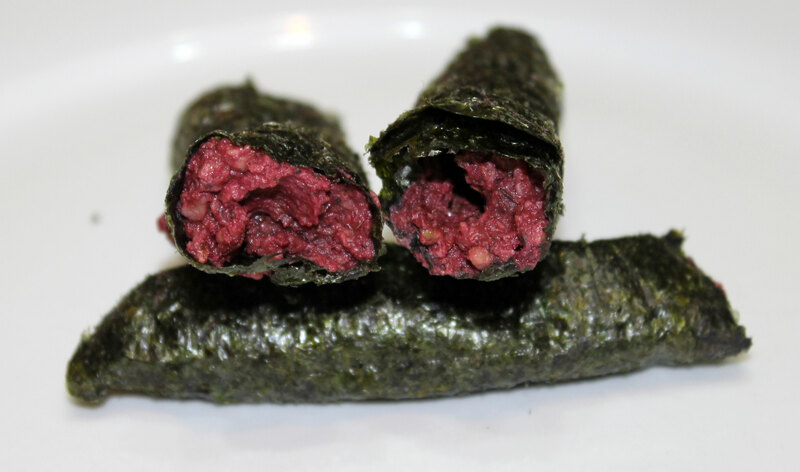 Roll the nori around the filling, spraying with a little more water if necessary. Press the edges of the slightly dampened seaweed together to seal. Repeat this with all of the other nori sheets. Place your nori veggie snacks on a dehydrator tray and dry overnight (I set the temperature of mine to 52°C/125°F). When they are ready, they should be firm and dried out, and the nori should be crisp. Allow to cool and store in an airtight container until needed. This is an AIP stage 4 reintroduction recipe as it contains tomatoes in the marinara sauce. When reintroducing foods on the AIP, I recommend this guide. Place both types of ground beef in a large bowl. Grind the fennel seeds in a pestle and mortar and add to the bowl. Add all the dried herbs, the garlic and onion powder and the chopped onion. Season well with sea salt and freshly ground black pepper. Mix well. This is easiest done with your hands. Now roll the mixture into small balls. I like to make them about the same size as a golf ball. 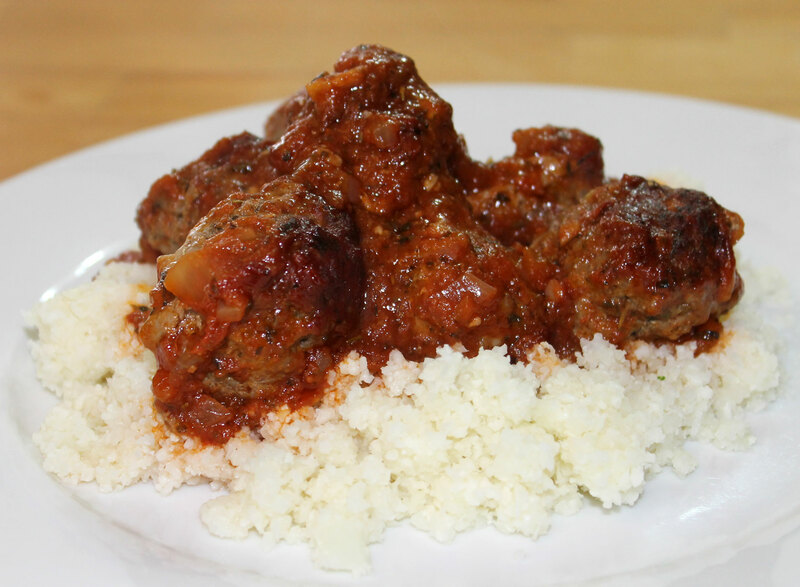 Place the meatballs on a rimmed baking sheet. 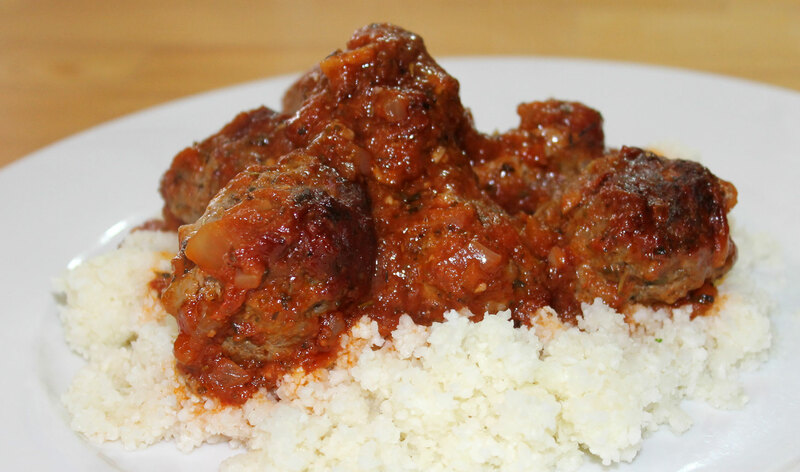 Bake the meatballs in the preheated oven for around 30 minutes until they are browned and cooked through. 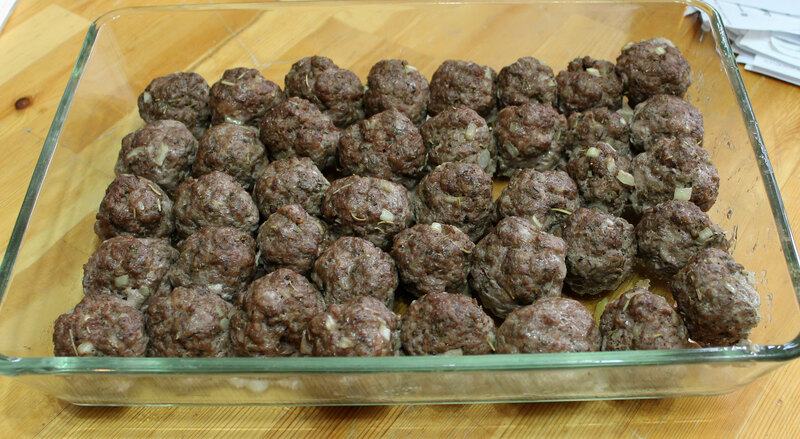 Now transfer the cooked meatballs to a glass baking dish. 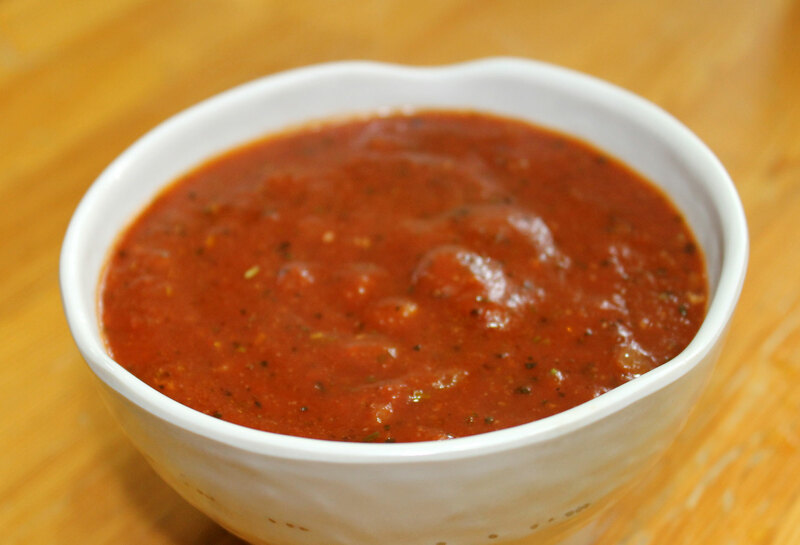 Ladle over 2-3 cups of marinara sauce. 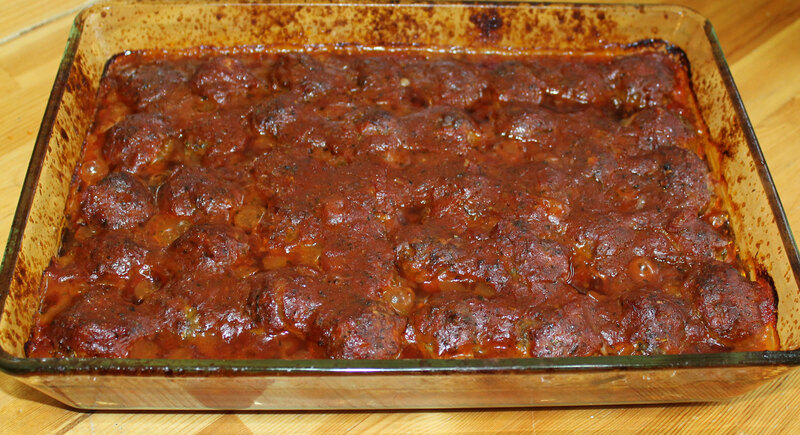 Bake the meatballs in the oven for a further 20 minutes until it is all bubbly. Serve over cauliflower rice, spaghetti squash or zoodles. 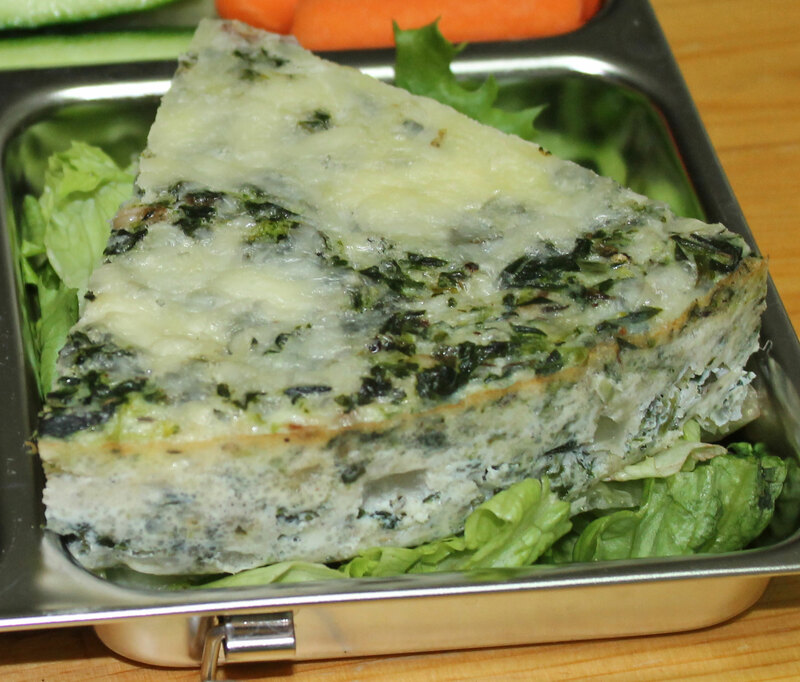 As I have mentioned is several other posts, crustless quiche make great lunchbox fillers. They are also very tasty for a light evening meal or even for breakfast. This particular one is vegetarian, but it is not vegan because it does contain some cheese for added protein. This also means that while it is gluten free, it is not dairy free. I tend to make this quiche on the days when I know I won’t be needing lunch as I cannot eat it. 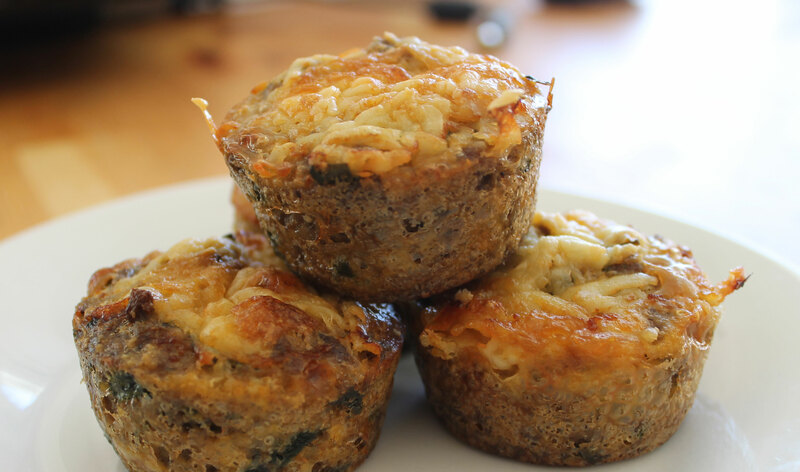 This recipe is an AIP stage 4 reintroduction as it contains cheese. When reintroducing foods on the AIP, I recommend this guide. Preheat the oven to 180°C/350°¼½¾F. Transfer the contents of the skillet to a bowl and set aside. In a separate bowl, beat the eggs with the coconut milk, salt, pepper, thyme and nutmeg. Mix the egg mixture with the spinach mixture and transfer to a circular 9″ diameter baking tin. I use a silicone one for ease of removal. Sprinkle over the grated cheese taking care to spread it evenly over the surface. Bake the quiche in the oven for 25-30 minutes until the egg is set and the cheese is starting to brown. Cool in the tin before cutting into portions. These are a popular lunch box filler in our house. They would also be great for a picnic or a snack. And I guess you could also eat them for a lighter evening meal with a salad as well. They are good both cold and hot right out of the oven. My family all love spicy food, so these are a little spicy. I am sad that I cannot eat them (chilli is a nightshade and is banned on the AIP), but then again, I also cannot eat eggs either… If you don’t eat chilli or don’t like spice, you can easily leave it out or reduce the amount to your taste. You cannot leave out the eggs however. Nightshade spices such as chilli are an AIP stage 4 reintroduction. Eggs are a stage 2 reintroduction. When reintroducing foods on the AIP, I recommend this guide. First of all you need to make your taco meat. Place the ground beef in a skillet and brown, stirring it often. Remove and allow any excess fat to drain. Melt the coconut oil in the skillet, and add the onion and mushrooms. Cook gently for 5 minutes or so until the onion is softened. Return the ground beef to the skillet and add all the spices, herbs and other seasonings. Toss well for 5 minutes until everything is well mixed and heated through. Turn the ground meat into a large bowl. Now you need to wilt the spinach (I use the same skillet and just toss it with the water that clings to the leaves after washing it). Once it is wilted, chop the spinach finely and add to the bowl along with the beef. Add the eggs, coconut flour and almond flour and mix everything well. Pour the batter into muffin cups (I like silicone ones), filling each one ¾ full. Don’t overfill them or the mixture will run everywhere making a mess on the base of your oven! 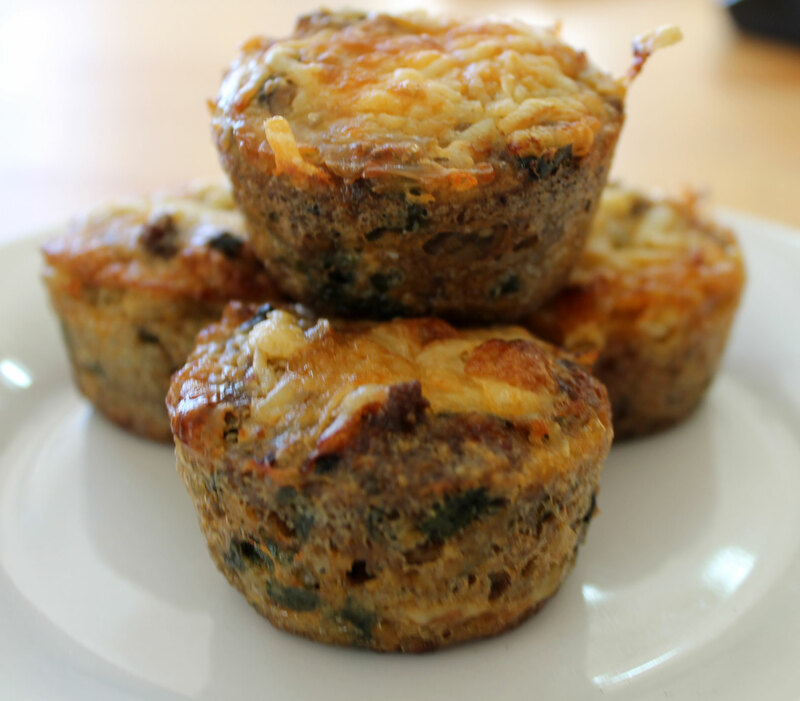 Top each muffin with a little grated cheese if using (this is not a paleo option, it is more primal, but it does taste good). Bake in a preheated 190°C/375°F oven for 20-30 minutes until set and the tops are browned. Cool on a wire rack and store in the fridge. Hubby and the girls all love ketchup. They will slather it on almost anything. (sadly I can’t eat it as it contains nightshades – tomatoes and spices, that are not part of the AIP protocol. I still make ketchup for those who can eat it though. They eat it for breakfast, as part of a packed lunch (to dip sausage or chicken nuggets etc), and it goes well with most evening recipes as well. We go through quite a lot of this stuff! 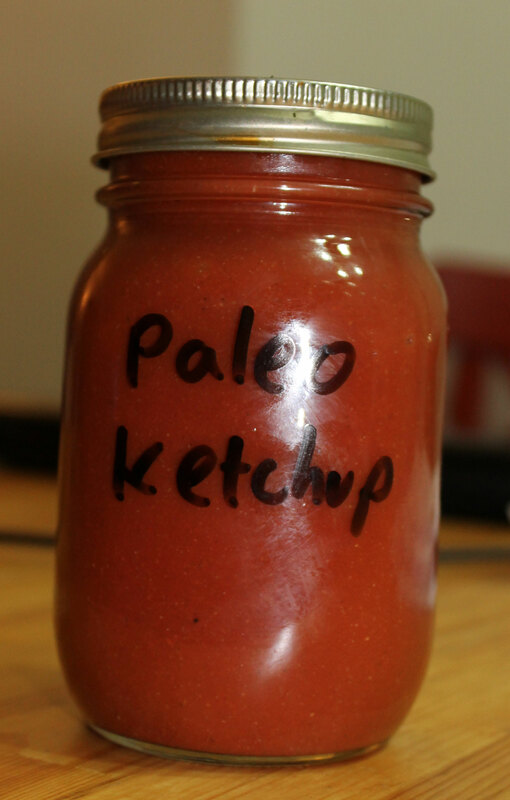 This is my most common “go-to” ketchup recipe. It has a good tomatoey flavour, but a spiciness that hubby and the girls love. And the best bit is that there is no sugar at all. This is an AIP stage 4 reintroduction recipe. When reintroducing foods on the AIP, I recommend this guide. This is a very simple recipe. You just put all the ingredients in a pan together and whisk until it comes to the boil. Reduce the heat to a simmer and cook for 5-10 minutes until thick. Cool and pack in a jar. Keeps well in the fridge. Being a massage therapist, I have to do a certain amount of “continuing education” (ie training courses). Over the last weekend, this was what I was doing. I did a fire-cupping course on both Saturday and Sunday and now I can offer cupping-massages, or even just use the cupping as part of my normal massages (it is fantastic for trigger-point release). It was a fun weekend… nothing like playing with fire! In addition to this, it was our wedding anniversary. So on Saturday evening, we visited Charcut in downtown Calgary (more on that in another post). It was a wonderful meal and I ate far too much! And C had her first ever parade with the Roundup band on Saturday as well. 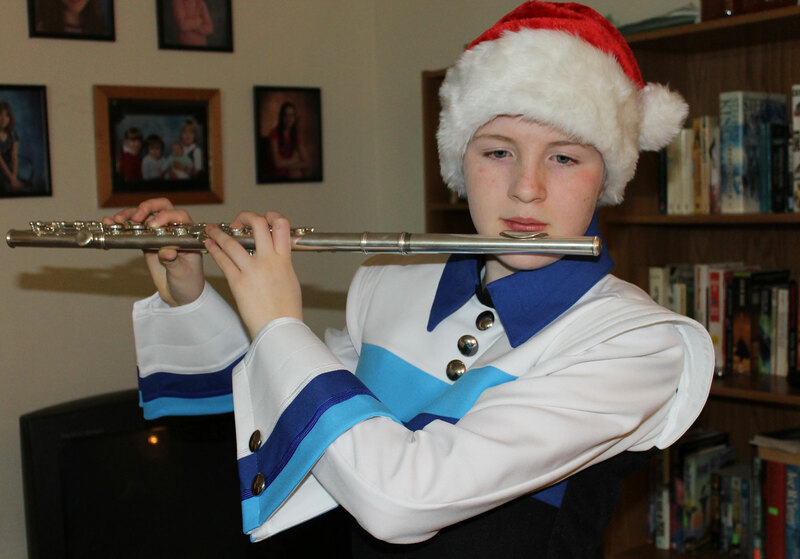 She was performing at the Santa-claus parade in Fort Mcleod. Yesterday I was at work, and considering all the snow that Calgary has been having over the last 2 days, it was a long day. And on my way home, I experienced the scariest bus ride of my life! There was so much snow and the roads had not been cleared and there were buses sliding all over the place, loads of accidents and buses getting stuck everywhere… And the traffic was really slow due to the road-conditions, so my normal 45 minute commute took over 2 hours. NOT FUN! By the time I finally got home, I was bitterly cold and I was not in the mood to write a post at all. All wanted to do was to collapse in a hot bath with a glass of wine! I love elk meat, and being a lean, wild meat, it is perfectly Paleo. We don’t eat a lot of it, but when we get the chance to go to the Calgary Farmers Market, we always make sure to visit the Wapiti Ways stand and buy some elk (usually stew meat, liver and hearts). The last time we were there, he pointed out some sliced elk shanks, and mentioned that they would be perfect for long, slow cooking (most elk is so lean that it needs to be cooked quickly or it becomes tough and inedible). 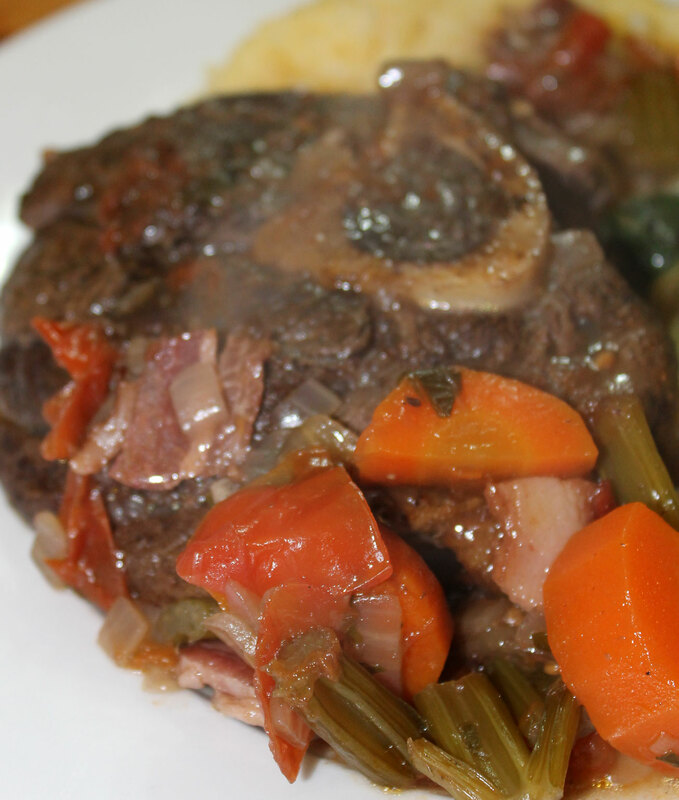 As soon as I saw the elk shanks, I was thinking “Osso Bucco”… and that is what I made with this wonderful meat. 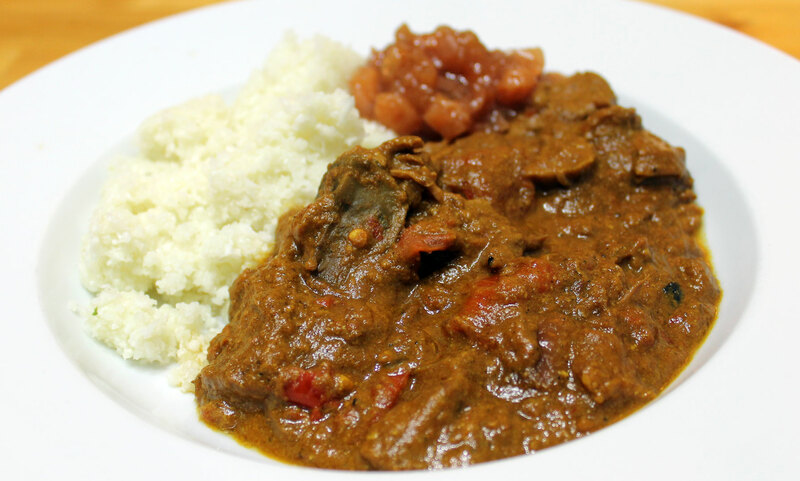 This recipe contains tomatoes which are an AIP stage 4 reintroduction. When reintroducing foods on the AIP, I recommend this guide. First of all you need to sear the elk in a hot pan with a little coconut oil added. Cook for 1 minute per side until golden brown. Remove the elk and place it to one side. Add the chopped bacon to the pan and cook over a medium heat until the fat runs and the bacon is starting to crip. Add the onion and 2 cloves of garlic and cook over a gentle heat until the onion is translucent. Add in the carrots and celery, and then add the thyme, bay leaf, lemon juice and pour in the entire bottle of red wine. Add the tomatoes and simmer gently until the vegetables are tender and the wine is reduced by at least half. Taste and season with salt and pepper. 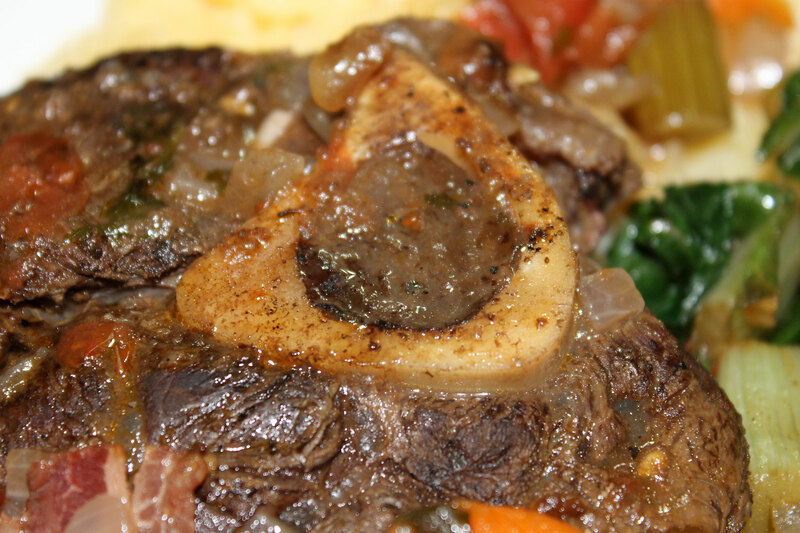 Nestle the elk shanks on top of the veggies and cook, covered, over a low heat for 1½ – 2 hours until the elk is tender but not falling apart. Turn or baste the elk every ½ hour. While the elk is cooking, place the cilantro, parsley and 4 cloves of garlic in a food processor along with the lemon zest and a glug of olive oil. Pulse until coarsely chopped to make a gremolata. 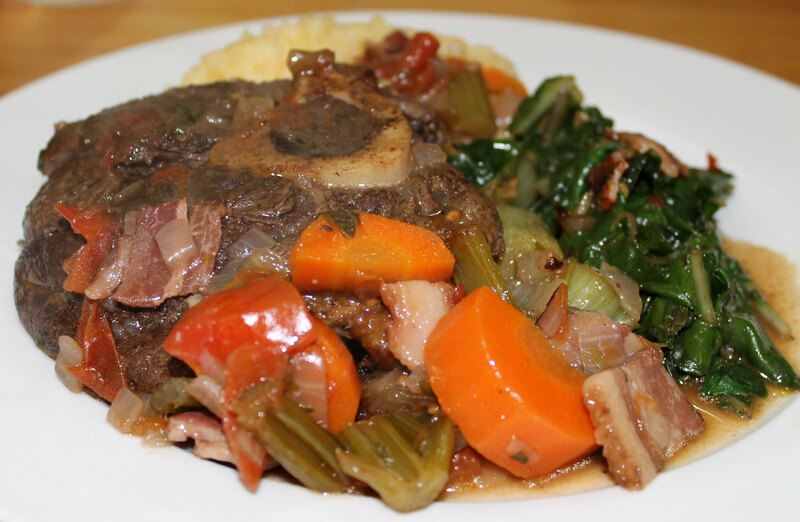 Serve the elk with mashed vegetables (I used mashed rutabaga) and greens and spoon over the gravy and some of the veggies. Sprinkle the gremolata over and serve at once. Just look at that wonderful bone marrow in there! When I scooped it out and ate it, it was rich, creamy and delicious! 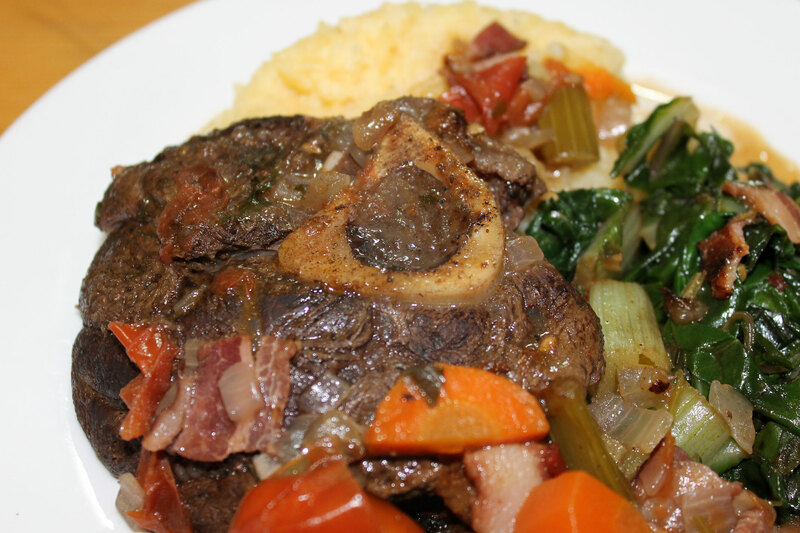 And the elk shanks themselves were perfectly cooked and very tasty. I love BBQ sauce with pork… actually, I love BBQ sauce with all meats! This is the sauce that I made to go with some pork ribs that I cooked last night for dinner. It is tangy and spicy, with just the right about of heat to complement the ribs. 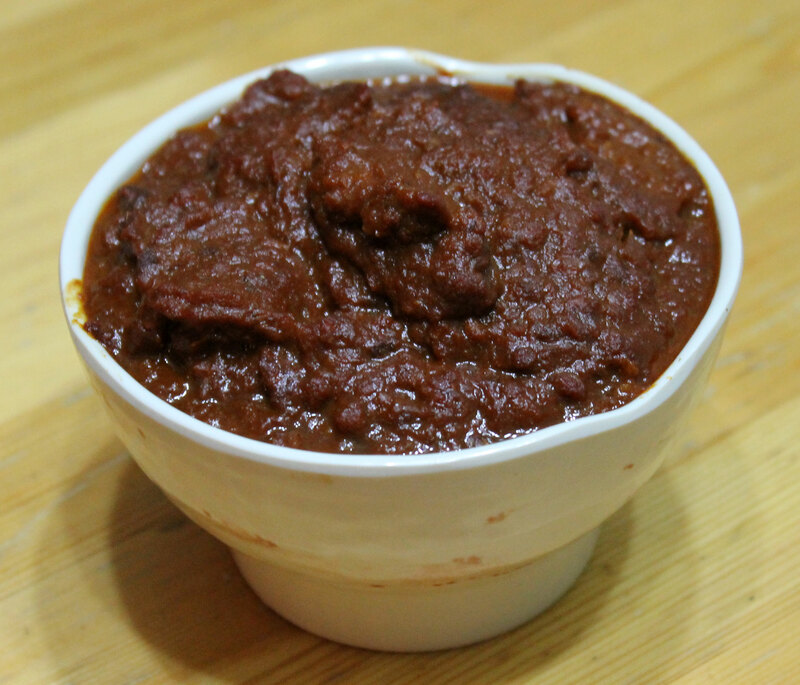 This recipe is a little more complicated than the previous BBQ sauce I posted, and it has a much more balanced spicy flavour. 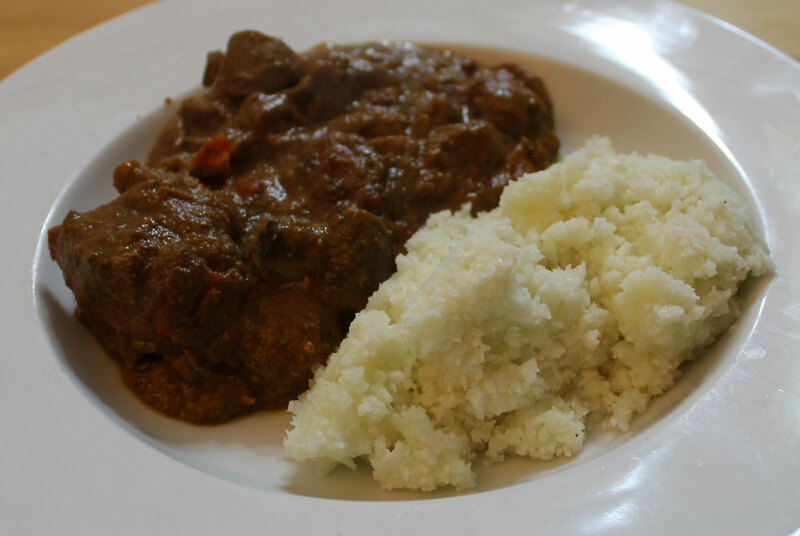 Because dates are used to sweeten the sauce and I used coconut aminos, it is also both Paleo and Whole30 compliant. Because none of us really like our ribs sticky, I cooked them with a dry-rub and then served the sauce on the side. This is a stage 4 reintroduction as it contains nightshade spices and tomatoes. Soak the dates in the boiling water for an hour to soften them. Place all the ingredients in the food processor and puree until smooth. Transfer the contents of the food processor to a pan and simmer gently for around an hour until the sauce is thick and the colour has darkened. Either use right away, or transfer to a jar in the fridge. This sauce gets better and better on being stored in the fridge. It will keep up to 2 weeks. This is a lovely dish that is baked in the oven. 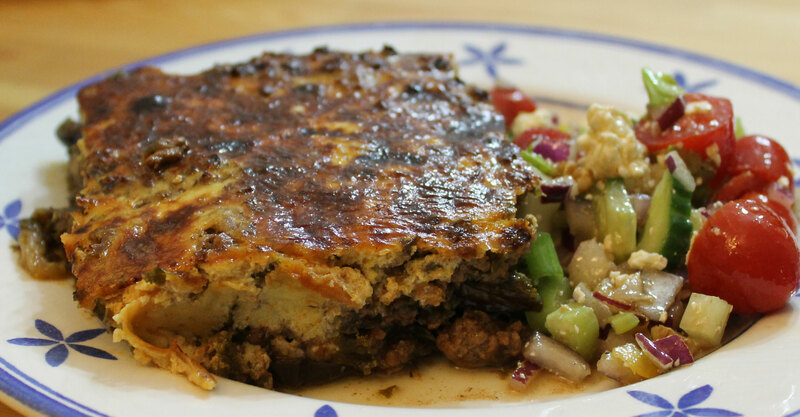 Moussaka is a greek dish, and pairs really well with a greek salad. 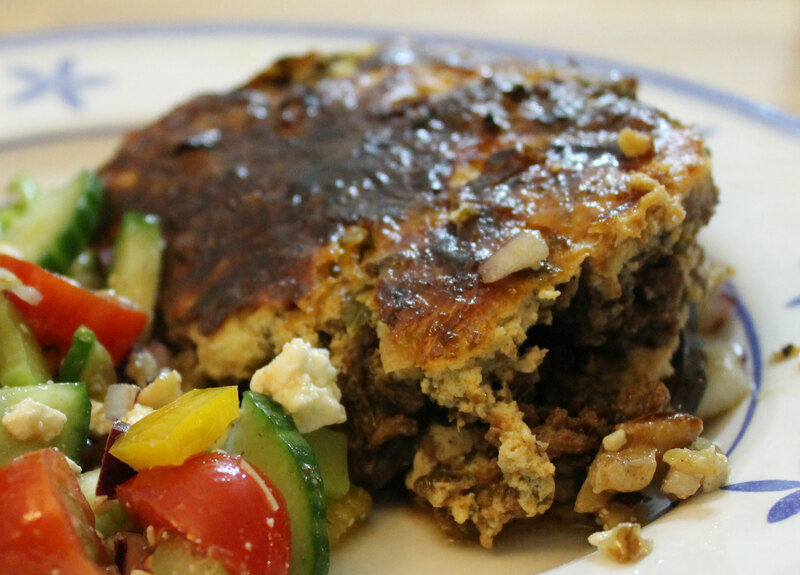 Most moussaka is not paleo – at the very least, it is primal because it includes cheese in the topping. In this case, I wanted to make a paleo version because I react badly to dairy, so I replaced the cheese with nutritional yeast. The eggplant and tomatoes in this recipe makes it a stage 4 reintroduction. When reintroducing foods on the AIP, I recommend this guide. Salting the eggplant does not reduce the bitterness contrary to what a lot of people think. Most modern eggplants are not all that bitter to start with. But what it does do is reduce the amount of oil that the slices of eggplant soak up, and that results in a less-greasy dish in the end. To salt your eggplants, simply sprinkle the slices with a little salt and place them in a colander and allow to drain for 30 minutes. Then rinse off the salt and pat them dry. I like to lay them out on a tea-cloth. Heat a couple of tablespoons of coconut oil in a heavy skillet and add several slices of eggplant. Saute the slices, turning as necessary until golden brown and soft. Remove the eggplant to a plate and repeat until all the slices have been cooked. Set the eggplant to one side. Boil the kale in water for 5 minutes until tender. Puree the kale with the canned tomatoes and bone broth in a food processor. Heat 1 tbsp of coconut oil in a pan and add the onion and garlic. Cook over a medium-high heat for 5 minutes until the onion starts to soften. Add the ground beef and cook, stirring until the meat is browned – aprox. 5 minutes. Now add all the spices and herbs except for the nutmeg, the contents of the food processor and bring to the boil. Reduce the heat to a simmer and cook for 30 minutes until the sauce is thick. Taste and adjust the seasoning as necessary with salt and black pepper. While the sauce is cooking, preheat the oven to 180°C/350°F. Whisk the eggs, coconut milk, nutmeg and nutritional yeast together and set aside. Once the sauce is cooked, use half the eggplant slices to line the base of a square baking dish. Top with half the meat sauce, and then repeat the layer with the remaining eggplant and sauce. Pour the egg and coconut milk mixture over the top. Bake for 45 minutes until the topping has set and is a golden brown colour. Allow to rest for 20 minutes before serving. 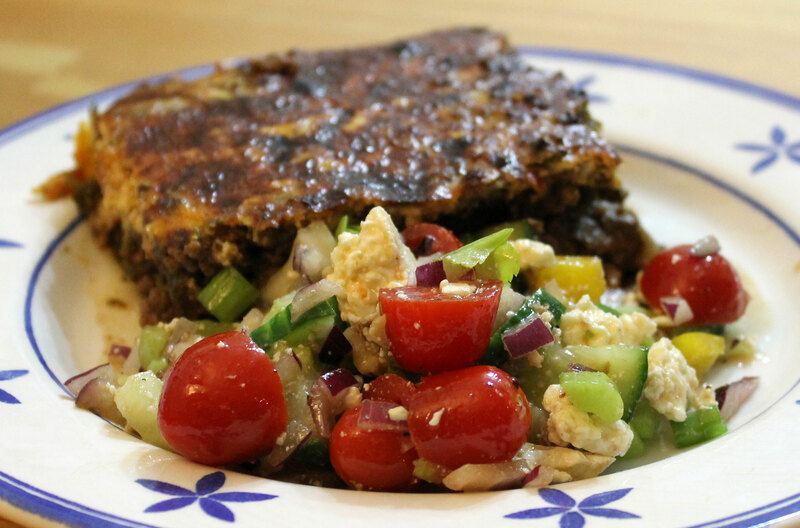 I served this with a greek salad (tomatoes, cucumber, red onion, olives and feta cheese) for most of the family, and I had a similar salad but without the feta cheese.